ArtsWestchester began in 1965 as a conversation among arts advocates and volunteers in a living room and has grown into is New York State’s largest private, not-for-profit cultural service organization. In 1975, we were named by Westchester County government as the County’s designated arts council and we became one of several united arts funds in the country, providing grants and technical support to cultural organizations and artist residencies in the community. In 1998, ArtsWestchester’s mission came full-circle when we acquired and renovated a nine-story neo-classical bank building at 31 Mamaroneck Avenue in White Plains, NY. The historic building in the heart of the downtown not only serves as ArtsWestchester’s headquarters, but also as a cultural resource for artists, cultural organizations, and the entire Westchester community. Learn about our building below. 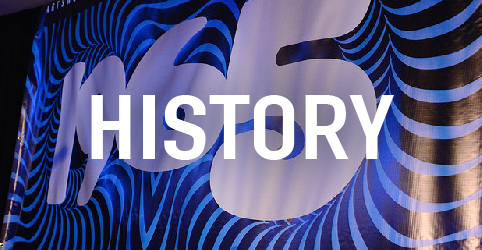 In 2015, to celebrate our 50th Anniversary, ArtsWestchester implemented several major initiatives to secure our legacy and impact the cultural life of Westchester for the future. Read about it here. Today, the arts are thriving in Westchester largely because ArtsWestchester, in partnership with Westchester County Government, has put the arts on the public agenda, investing more than $35 million over the years in arts and culture in the county. In Celebration of 20 Years in Our Historic Home in Downtown White Plains. 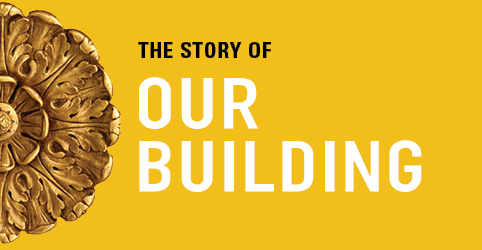 Download a PDF of our Building Story. Model T Fords along East Post Road jockeyed for scarce parking spaces. White Plains hustled and bustled; it had grown into a city. New technologies, including radios, movies and automobiles proliferated. People shrugged off old forms and embraced the future. Flappers danced the Charleston, the sounds of jazz filled the air – and plans were drawn to raise the first skyscraper in White Plains. The word “skyscraper” was originally the nautical term for the tall mast on a sailing ship. The White Plains Daily Reporter itemized all the materials used in the building’s construction including 24,000 bags of cement, 180 tons of steel and 370,000 bricks. A reinforced concrete mat, three feet thick, was used as the foundation. The base building is made of limestone. During the late 19th and early 20th centuries, limestone was a popular material for the construction of banks. The resilient material’s whitish color is frequently used in the construction of neoclassical buildings because it references the look of Ancient Greek and Roman classical construction. Our building is balanced and symmetrical, which is also characteristic of Neoclassical architecture. The remaining seven stories are made of brick backed with cinder concrete blocks. Brick was used for the upper stories because it is long lasting and less costly than limestone, which is a fairly expensive type of stone masonry and the windows are made of metal with bronze on the banking quarters and steel on the floors above. Harold P. Zoller specialized in bank designs. Born on June 18, 1889 in Fort Plain, NY, he graduated from the School of Architecture at Columbia University in 1914 and resided in White Plains during the 1920s. 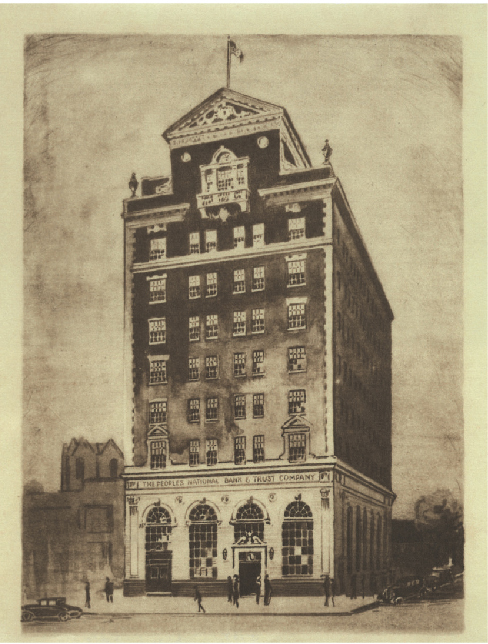 In addition to his work on banks, he supervised construction of government hospitals during World War I and designed a number of large Tudor residences, including one in White Plains. Stand inside the former bank lobby near the current glass doors and take in the scale and overall appearance of the room: 40-foot ceilings, marble floors and accents of walnut and bronze speak of richness and grandeur. References to Greek and Roman architecture further the sense of safety, security, and longevity—bank customers must have surely felt their money was in good hands. And so it was—the building has a completely fireproof interior. Look up to see that the ceiling is made up of large sunken panels or boxes. Known as a “lacunar” or “coffered” ceiling this method is an alternative to tile frequently seen in Neoclassical and Greek Revival buildings. The details in the ceiling are hand-painted in bold geometric patterns and accented by three-dimensional decorative rosettes placed at regular intervals. In 2004, when ArtsWestchester restored the space, the removal of florescent light panels revealed a fragment of one of these rosettes. 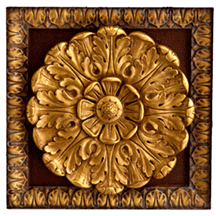 A mold was created in its form and the rosettes were replicated in plaster and coated in thin sheets of gold foil (gilded). The Grand Banking room’s soaring Palladian-style windows line the western and southern walls. These windows were quite innovative as most other banks built in the late 1920’s put iron grilles on their windows. Perhaps the builders felt window grilles were unnecessary because the bank also had the most up-to-date security system of its time—tear gas guns in the walls which could be fired with the press of a button to foil would-be bank robbers. At the far end of the Grand Banking Room is the massive steel vault. Banks began installing vaults shortly after the Gold Rush of 1849 because unsuccessful prospectors turned to robbing banks, and the small safes commonly used at the time could easily be picked up and carried out of the building. By the 1920s, large, heavy vaults had become the standard. Note that doors are several feet thick—this was to make it difficult, if not impossible, to cut through them with heat. A focal point of the Grand Banking Room is the commemorative Freedom mural that hangs at the far end of the room just above the vault. Designed by Angelo Magnati and painted by Alex Bonanno, Freedom is meant to signify White Plains’ pivotal role in the Revolutionary War. 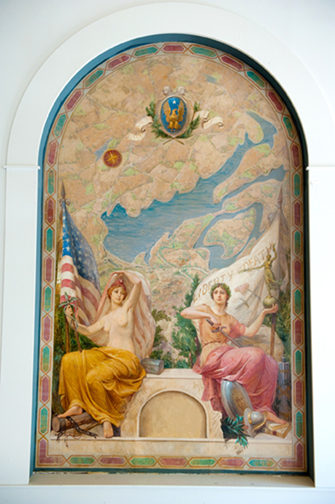 In the background is an aerial view of the Kensico Lakes located just north of White Plains; the foreground features two female figures, Freedom holding the American flag and Liberty holding the flag of White Plains. For some years in the mid-20th century this historic painting was obscured from view by plasterboard walls lest the bank’s patrons be offended by the mural’s depiction of a bare-breasted woman. The Palladian style of architecture was named after Andrea Palladio, a Venetian architect influenced by Ancient Greek and Roman architecture, who lived from 1508 to 1580, during the Renaissance. By the late 1980s the Peoples Bank & Trust Company Building had been vacant for three years. Major retailers moved away from the downtown area, many storefronts were closed up and a feeling of blight pervaded the district. The availability of this unique building, located in the heart of Westchester’s capital city, presented a once in a lifetime opportunity. Where others saw an abandoned wreck, ArtsWestchester’s Board and Executive Director saw a future. In 1998 ArtsWestchester purchased it from Chase Manhattan Bank for $1,200,000. In November of 2000, JP Morgan Chase retired the mortgage, in effect donating the building to ArtsWestchester. Starting in 2003, the building’s Grand Banking Room underwent a major renovation. A new feature in the Grand Banking Room, added during the renovation, is the mezzanine. The half windows on the mezzanine level face out to what is now a sculpture court, adorned by Windows on the Past by Richard Hass, one of America’s most accomplished contemporary muralists. Through the painted windows, the viewer looks back in time at three significant White Plains buildings that were destroyed during the ‘urban renewal’ in the 1960’s. Today, that initial vision has been realized, and the seventy-five year old bank is full of life. What was once the Grand Banking Room is now both an art gallery and performance space that showcases Westchester’s brightest talents. It also serves as a meeting space and banquet hall for Westchester’s arts and business communities. The upper floors buzz with creativity as well. The building is home to artist studios, a rehearsal space utilized by local theater companies, arts-related businesses, more gallery space, and the headquarters of ArtsWestchester. Sullivan Architecture, whose offices are in the building, led the renovation and continues to work with ArtsWestchester as we continue to update our home.